Weight: 1.53 ct; size: 9.20 | 7.79 | 5.33 mm; shape: oval; colour: medium dark bluish violet; very slightly greyish; clarity: eye clean; cut: excellent; treatment: none. Very clean specimen; design ‘Ovalimixtum’ [second crown angle changed to 28.00], excellent cut by Tan Pen. 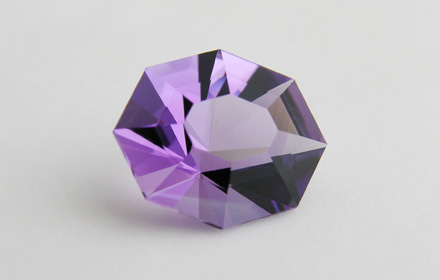 A violet variety of quartz. The colour is caused by iron impurities in the 10s to 100s parts per million range.